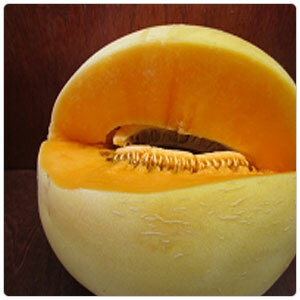 The Golden honeydew melon has a similar shape and texture to the common honeydew. Its most obvious difference is its bright golden-hued skin. When ripe its skin is firm, thin and smooth. Its flesh is succulent, velvety and sweet. A faint aroma and a slight opening at its blossom end will also indicate ideal ripeness. An overripe melon is soft to the touch and it develops a bitter flavor in its flesh. The ancient cradle of melon cultivation is the Middle East, where melons have been growing for thousands of years from Egypt to India, but they grow well in any temperate area that has a growing season long and hot enough. Melons were imported to the western hemisphere by Columbus on his second voyage. Their cultivation spread quickly from the Caribbean as far north as New England. Today most melons consumed in the US are produced in California.